Indeed the new baseball glove is never soft and eligible for good gameplay. You will need to put special efforts if you want to make it game ready. There are different tricks that one can follow so that they can make the glove game ready but make sure to use these methods wisely as you don’t want you to damage your newly bought baseball glove. Through this piece of writing, we are trying to inculcate some of the prominent methods that will help you in breaking in baseball glove. We have provided some of the steps and the important tips that one can follow for breaking in baseball glove. Yes, this is the most traditional and trusted method when you are trying to soften your baseball glove. The numbers of time you will grab the ball make sure to squeeze the glove around the ball. It will help in softening the glove, and after few matches, the glove will be perfect. Note: This method is stated to be the safest and the oldest methods of all. Steaming The Glove: In this method, you will need to apply glove conditioner on the glove that will help you in opening the leather. Then you will require steaming the glove under 150 degree and then break the baseball glove using the mallet. The steaming of the glove will relax the leather and makes it game ready. Using Microwave: In this method, you are required to put the glove into the microwave for not more than 50 seconds and then take it out. Be careful while you are using this method as it may lead to sparking in the oven and that may cause a serious accident. Using Oven: You can preheat the oven, turn it off and then put the glove inside for 10 to 15 minutes. This will help in breaking the baseball glove. Another possibility and drawback of this method are that it may damage the leather for forever. Using Car’s Green House Effect: The car can achieve can the temperature of 150 degrees on a hot afternoon and this can help in softening your glove. But again there is a drawback that the excess of heat may destroy the thread and hence it can eventually lead to a damaged baseball glove. Hence one should try to use the traditional steaming on the stove so that they can have the damage free and instant breaking of the baseball glove. First of all, take a glove Mattel. You can either buy it or make it from an old baseball bat. Wear the glove in your hand and start beating the pocket of the glove from the hand you throw the ball. For more aggressive beating, you can put the glove on the floor and then hit the outside leather instead of the pocket. Note: There is conditioning method in which the people suggest you wet and dry the glove using water and sunlight. But this may damage the leather, and hence one should try not to follow this step but only the beating for breaking the baseball glove. First and foremost thing is one should never use the regular oil or conditioners like petroleum jelly. They may hurt the leather. One must always choose the lubrication product recommended by the manufacturer company. Finally, one should never use the excess of oil when they are doing the lubrication. Fold the glove so that then thumb and the finger can meet. Then take a shoelace and tightly tie the folded glove. Put the ball inside the folded glove and leave it in same position for some time. This method will eventually make the pocket, and you don’t need to do anything. By using the ball, you can give proper size to the pocket, and hence you can get a pocket by breaking in baseball glove using the ball you the size you want. 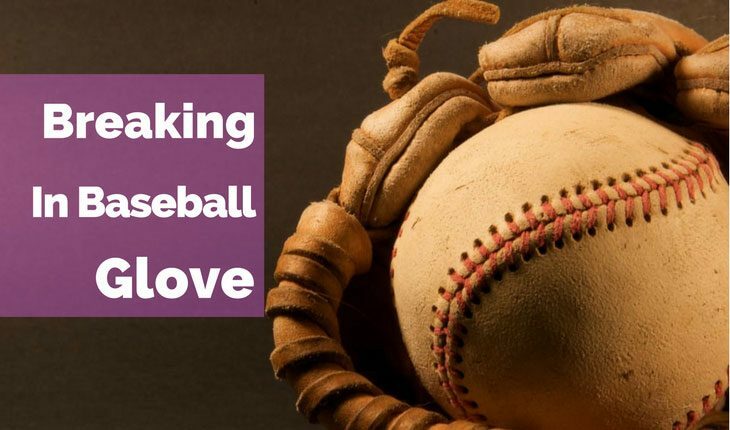 Breaking in baseball glove is quite an easy procedure, but you need o extra careful because you are trying to soften the leather that may lead to some damage. Make sure to follow the ‘don’t rules’ of safety tips while you are applying defined procedure for breaking in baseball glove.